Glitter Grammy Plays With Paper: I'm Thinking Christmas and it's going to be 90 degrees today! I'm Thinking Christmas and it's going to be 90 degrees today! Amy (my daughter) is home for a visit and she is helping to improve my photos by taking them in a photo booth and making appearance improvements in PhotoShop Elements. She is teaching me to straighten them, as well as improve the lighting....Well, at least while she is sitting by me it's working! Thank You Amy....she's being very patient with me and I think she is beginning to realize that age has dulled my ability to remember steps. Amy is a professional photographer, see her web pages - http://www.amylynnschereck.com/ If you want to see great photos, that would be the place to look. 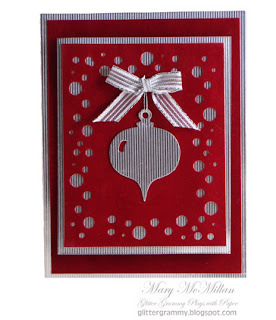 The ornament card was listed previously. If you want to know more about it, go to a previous blog post. I made the sleigh card a few months ago. My memory of what paper I used for the base of the card is faded and of course, I have no sheets to compare it to...I'm sorry about that. I do want you to know the glittery areas were already on the card stock. One of my New Years resolutions is to work on keeping better records....The sleigh was cut using the Spellbinder sleigh. I embossed it and then using black liquid chalk I colored the embossed areas. I added the silver cord to give the card dimension. 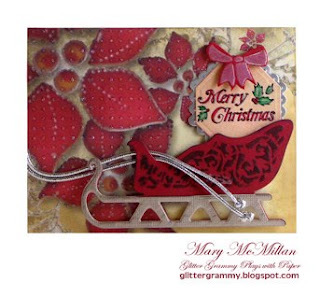 The runners on the sleigh were cut from silver card stock and chalked. The Spellbinder was again used to cut the hexagons which surrounded the stamped "Merry Christmas". Amy also taught me how to make my watermark...thank you again Amy! Today we will be resting up for Brianne's wedding (my girlfriend's daughter) which is tomorrow and then on Sunday we are off to San Francisco to visit my son, Dan and to have a few days to play. If I don't see you for a few days....keep creating, I'll be excited to see what you've done. Have a wonderful weekend. Gorgeous holiday designs ... and beautiful pictures too. wow, I will take some lessons, I luv enhancing my pictures but do not know that much about it...your cards are spectacular....gorgeous work! Oh Mary, these cards are wonderful! And you photos are too! I had to laugh because I have struggled so much with my photos! There is so much to learn for those of us that did not grow up with a computer!